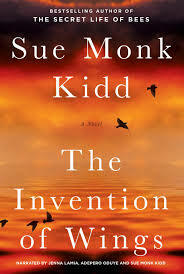 a book chick: "The Invention of Wings"
my take: Oh, I really wanted to love this. I mean, The Secret Life of Bees was so memorable. After I finished reading this, I couldn't remember anything - the title, the cover, even that I'd read it. Ouch. Dang. I thought maybe it was just me; however, my mother reported the same. Which isn't to say it's not worth a read. Actually, after the brutal deaths of nine Americans in Charleston, I read many things online about how WHITE Americans can begin to understand and act on that understanding with regard to how BLACK Americans experience life in America. In this historical novel, our two heroines play out the roles of black persons in the 1800s in the American south and the white persons with wealth who own them. And what I thought about is the character Sarah's response to the inner voice telling her that the subjugation of her own slaves is wrong: she leaves the South and becomes a Quaker. One way to fight racism and oppression. At least it's something. My to read list is so long... this one just moved down a few slots. Gotta prioritize! You nailed it. I felt guilty about finding the book tiresome. We'll have to see how the Bookies discussion goes on this one.